Related: an upcoming event – ‘Embargo 2010: Industry Conversation on Future Rules of Media Engagement’ with SiliconValleyWatcher’s Tom Foremski, Mike Arrington from Techcrunch and Mark Glazer from NPR’s Media Shift, moderated by Sam Whitmore from Media Survey. This entry was posted in Editors' pick, Newspapers, Online Journalism and tagged alan d. mutter, embargoes on October 22, 2009 by Judith Townend. BBC science correspondent for the West Midlands David Gregory braves a ‘them and us’ post, blaming Twitter and bloggers for leaking the ‘water on the moon’ story ahead, hold your breath, of the embargo. Journalists had been tipped off about the moon water announcement ahead of NASA’s big press conference by the journal Science, while another NASA release named the scientists taking part. With that information the bloggers predicted the scoop, leaving the 2000 chosen journalists behind. Then, Gregory says the story was reported in the mainstream press in India, and picked up by the Times’ Delhi correspondent. Gregory doesn’t link to the blogger or Twitter rumours and cites the Indian press as the place the story went mainstream: does anyone know where it first broke online? This entry was posted in Comment, Online Journalism, Social media and blogging and tagged david gregory, embargo, embargoes, moon water on September 25, 2009 by Judith Townend. TechCrunch’s announcement that it will break every embargo it agrees to has caused something of a stir amongst PR and journo bloggers alike. “A lot of this news is good stuff that our readers want to know about. And we have the benefit of taking some time during the pre-briefing to think about the story, do research, and write it properly. When embargoes go right, we get to write a thoughtful story which benefits the company and our readers. Increased competition in the journalism industry is causing more and more embargoes to be broken, argues Arrington, creating ‘a race to the bottom by new sites’ and a climate in which, he says, TC can’t operate. Certain ‘trusted’ companies and PR firms will continue to have their embargoes honoured by the site, but the hope is that by disregarding the rules firms will have to be more selective with who they break news to and clamp down on those repeat offenders breaking embargoes. Arrington will also be posting a blacklist – now topped by TC – listing all firms and publications involved when an embargo is broken. ReadWriteWeb has come back on Arrington’s decision, saying it will honour embargoes. While the site agrees that the press should get better at respecting them, RRW says embargoes give more outlets a chance to cover a story, providing multiple perspectives for readers. Journalism.co.uk receives its fair share of embargoed news and releases – and has never knowingly broken any, because we want to cultivate good relations with tipsters, companies and PR firms. This doesn’t mean we’ll cover everything that gets sent our way. We also know other journalism news sites will be getting much of the same info and agree this can make it more of a race to get the news out. But from our perspective: we have two full-time journalists, so having good contacts with companies and PR is vital to our expanding our newsgathering. 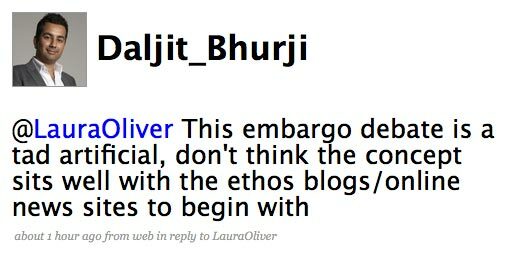 However, as a twittered reply from @Daljit_Bhurji, founder of Diffusion PR, suggests, does the old-fashioned embargo model really work for online? Reporting on our specialism – as I’m sure is the case with many other subject-specific publications – it’s increasingly apparent that the organisations/titles/companies we write about are becoming their own news sources. e.g. have their own press office, press release feed, blog/write about their own developments. Sending an embargoed release about this info to us later isn’t a great help. Most of the time I’d rather learn about it if it’s covered in a blog-style like the BBC Editors blog or Guardian’s Inside blog. We’re then free to dig deeper into that news if needs be and are given a direct line to the people behind it; or pass it on through another of our channels like Editors’ Pick. Holding back the news tide with embargoes seems to go against the way information and news spreads online through links, official ‘leaks’ (as referred to above), blog networks etc. What’s more it’s not just quote-unquote journalists covering news releases any more – is the industry expecting other writers and bloggers online to respect embargoes? It goes against the grain of the web. Are embargoes redundant in the online age? This entry was posted in Journalism and tagged BBC, Bhurji, blog networks, Diffusion PR, embargo, embargoes, founder, guardian, Journalism, Journalism.co.uk, Michael Arrington, online age, PR, ReadWriteWeb, TechCrunch, USD on December 18, 2008 by Laura Oliver.